Tiffany Johns, B. Kin., is one of our Vancouver based Pilates Process ™ teacher trainers. A recent graduate of UBCs kinesiology program, Tiffany’s final project was the development of a paper presenting the most recent research on pelvic floor function. The paper’s specific focus is on Stress Urinary Incontinence (SUI) but its relevance spans all pelvic issues, including prolapse and sacral function. I have summarized some key aspects of Tiffany’s paper. Do you pee when you sneeze? Run? Cough? SUI is defined as the involuntary leakage of urine during activities of increased exertion or pressure. Estimated to affect 20 – 50% of women (and yes – it can affect men too) it is a significant problem. It was assumed (somewhat dismissively) that all SUI sufferers were middle aged women who’ve given birth to several large babies. But research disputes this narrow window and finds many SUI complainants are in their twenties, athletic, and are female and male. From it’s introduction in 1948 the kegel or pelvic floor muscle contraction has been the go to solution prescribed by doctors and clinicians for decades. The kegel however has only offered partial success and for only some people leaving many without any improvement at all. 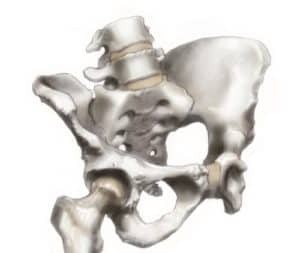 And it’s not just the nuisance of incontinence at stake, SUI can be indicative of inadequate stability in the pelvis and low back. Pelvic floor muscles attach to the sacrum, the sit bones and the pubic bone. Strengthening frequently fails to solve the problem. What’s up with that? It turns out that, as with other body parts pelvic floor muscles can have too little tone or too much tone. And both are common. A muscle that is too “on” is as ineffective as a weak muscle that never activates. Perhaps the group with weak pelvic floor muscles respond to the kegel approach but for those with too much activation it can be ineffective or worsen symptoms. The pelvic floor muscles have to increase tone with pressure changes such as coughing. If muscles live in 100% of contraction there is nowhere to go when needed. For this group, release will be more important than strength. If not the Kegel then what? The pelvic floor is part of what is referred to as the inner unit. A complex stability system that includes the pelvic floor, the diaphragm and the deep abdominals. Research shows that the coordination of the diaphragm and the pelvic floor muscles are critical to healthy function. 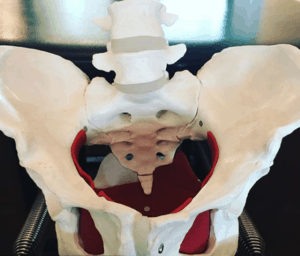 For the diaphragm to function well the abdominals and pelvic floor muscles cannot be over active and must be able to release, to be responsive to the movement of the breath. (yes – everything always returns to the breath)! So when we breathe in the diaphragm descends, the pelvic floor must also descend. When the diaphragm returns upwards on an exhale, the pelvic floor also lifts. And on a sneeze or a cough, the pelvic floor muscles and diaphragm both elevate in sync. How do I figure this out? Fear not, there is lots of help available. There are physiotherapists who specialize in pelvic floor training. If you don’t want to start with that then start by focusing more closely on engagement and release. If you do kegels, try to pay attention to the release phase. Are you able to fully release the pelvic floor muscles? Kneel on all fours. Are you able to fully release the abdominals? If you sit and breath are the abdominals responsive? Do they move lightly on the inhale? Well trained therapeutic movement teachers can help guide you towards better posture, core efficiency and breath, all factors in pelvic floor function. Looking for a physiotherapist who specializes in pelvic floor function?